Carolyn Sue Dimick passed away on Wednesday, April 11, 2018 in her home, surrounded by friends and family after a courageous battle with cancer. Sue was born on May 7, 1948 in Harvard IL to Frank and Roberta Horn. She graduated from Harvard High School in 1966. She married Erin Dimick on August 20, 1978 in Delavan, WI. Sue was the owner and designer of “Sue Who” clothing boutique on Flagler in New Smyrna Beach for the past 13 years until she sold her business in January of 2018. Sue was a businesswomen all her life. She started out selling popcorn at her father’s Shell gas station in Harvard, IL and went on to run a snack stand at the local pool. After high school she attended UW-Whitewater for a semester and then moved to Chicago, IL in 1967 to pursue her career as an entrepreneur. She started making and selling candles as she lived paycheck to paycheck working various part time jobs. In 1968 she met her husband, Erin Dimick, and they opened their candle factory and were in business until 1978. In 1979 they moved to Sanford, FL and continued to make and sell candles at various flea markets, including Maitland, Wagon Wheel, Webster, DeLand and the Winter Park Art Festival. In 1980 they made and sold giant cowboy hats based on the TV show Dallas while wearing shoulder padded outfits and western wear. In 1981 Sue began selling clothing at the Daytona Flea Market under the name brand “Sue Who”. Their business grew to be the biggest at the Daytona Flea Market until they sold it in 2002 and moved to New Smyrna Beach. Shortly after their move, Sue rented space at “Sun Design’s by Linda” selling lace t-shirt inserts and began using Swarovski Crystals to design her own clothing. In 2004 she opened her store, “Sue Who”. 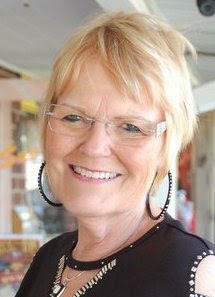 Sue loved her days at the store, she loved her customers and enjoyed helping women shop. When she wasn’t at the store she was working 12-14 hour days at home running the business, designing clothing and fulfilling mail orders. Sue is survived by her husband, Erin Dimick of Daytona Beach, her brother, Frank Horn of Harvard, IL, niece, Jennifer (Brian) Barncard and their children Nicolas and Rosie, of Kenosha, WI. She is also survived by many lifelong friends including the remarkable women who cared for her throughout her illness, driving her to appointments, bringing her meals, staying in her home with her and most of all loving her and supporting her though it all. Sue was blessed to have friends as her family and always expressed how humbled she was by the graces given to her from such dear friends. She is preceded in death by her parents Frank and Roberta Horn and her sister-in-law, Rosie Horn.